Create and run a GAUSS program from scratch. Use GAUSS functions, operators, and indexing. 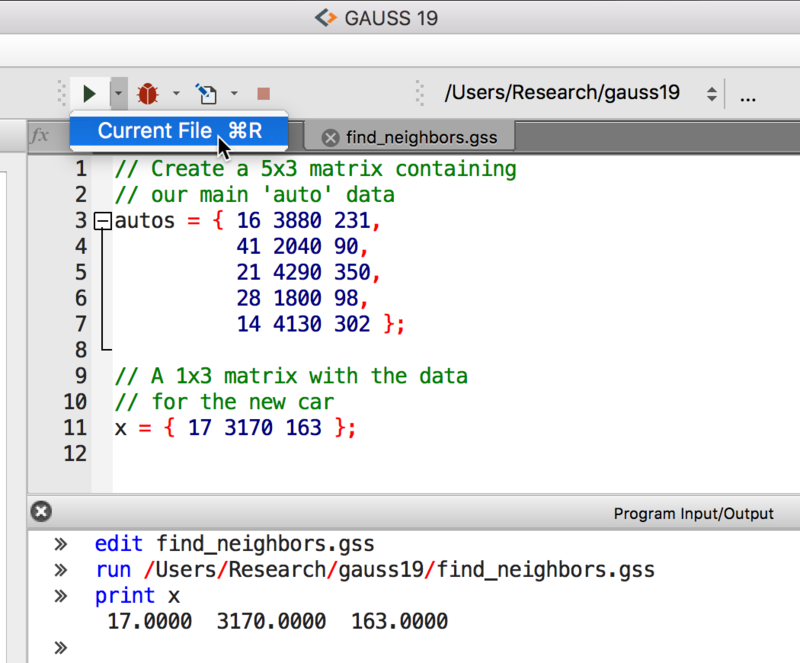 By the end, you will have a simple GAUSS program which performs a nearest neighbor search. 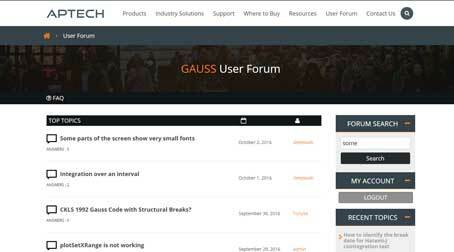 We recommend looking over Getting Started with GAUSS, before working through this tutorial. and that your task is to create a GAUSS program which can find the most similar car from your list when given the mpg, weight, and displacement for a new car. This command will open the file find_neighbors.gss in our current GAUSS working directory. Since the file does not yet exist, GAUSS will create a new file for us. GAUSS does not require any particular file extension for GAUSS program files, however, .gss is recommended. We will start our program by entering the data from the table at the top of this tutorial as well as data for a car that we want to compare. Note that lines which start with // are comments in GAUSS. Now that we have some code in the file, let's run it and create the matrices autos and x. Select the downward pointing triangle next to the Run button on the GAUSS Toolbar and select Current File as shown in the image below. Since the program only creates two matrices, we will not see any output. We can verify that the data was created, by using the print keyword as shown in the above image. However, to make things simpler, we will work through each part of that statement separately. Next we use the element-by-element exponentiation operator, .^ to square each element in the matrix of differences. We can sum across the rows of our squared difference matrix with the sumr function. Now we can compute the distance by taking the square root of each element of our vector. It is clear from looking at the computations shown above, that in this case, the car from the first row of the autos matrix has the shortest distance from the sample car represented by the row vector, x. However, to compare larger datasets, we need our program to search for us. The GAUSS function, minindc, returns the index of the smallest element in each column of a matrix. Now that we have found the index of the row with the smallest distance, we should add some print statements so that our program can tell us what it found. Looking over the original data, this answer appears correct. Created and run a GAUSS program. 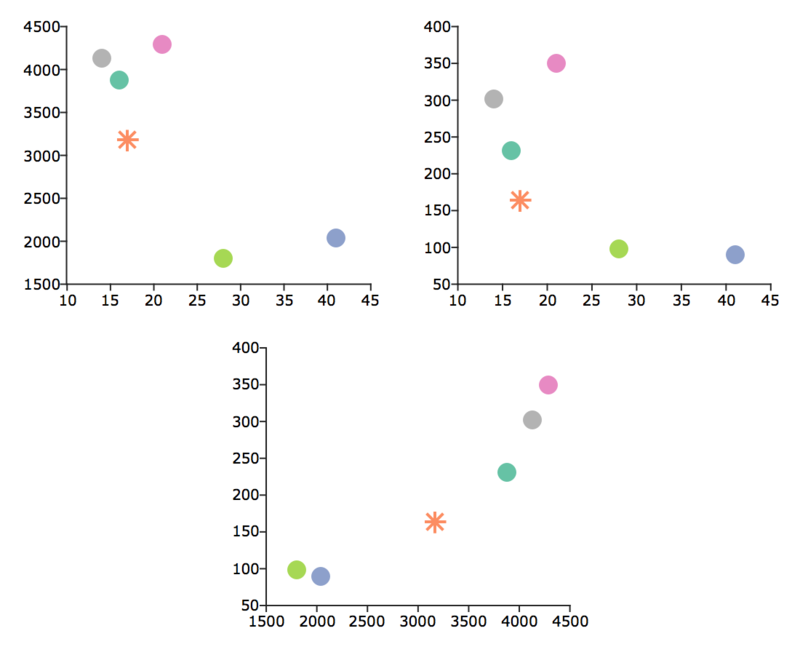 Used GAUSS functions, operators and indexing to perform a nearest neighbor search.